Seated: Ryan Peters, Cody Rosinski, Hanson Schmid, Aris Bird, Sharyse Goodell, Christine Bradt, Jeff Morris, Dylan Clark; Standing: Instructor David Berkstresser, Joshua Peters, Brett Hoffman, Melissa Murphy, Bonnie Tracy, Michael Olney, Jim Tracy, Thomas Freeman, James Carroll, Barb Winslow, Scott Eisenhart, Scott Cornell, Jeffrey Abrial, Paul Mierek, Chad Burdick, Patrick Buck, Michael Rixford. Missing from photo are: Yuri Pashchuk, Lindsay Payne, Mary Roach, Scott Ward and Jenifer Temple. Courtesy photo. Volunteers from Woodgate, Old Forge, Eagle Bay, Raquette Lake, Otter Lake, Forest-port, Stittville, Western, and Remsen recently wrapped up five months of EMT class training at the Woodgate Volunteer Fire Department. 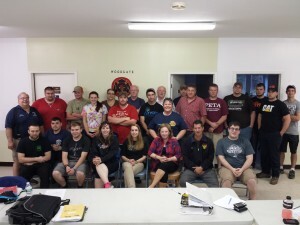 Of the 29 students enrolled in the class, 23 were seeking their basic EMT certifications while the remaining six received EMT refresher training. This entry was posted in admin and tagged EMT Training, Volunteer, Woodgate on May 21, 2015 by Marianne Christy.